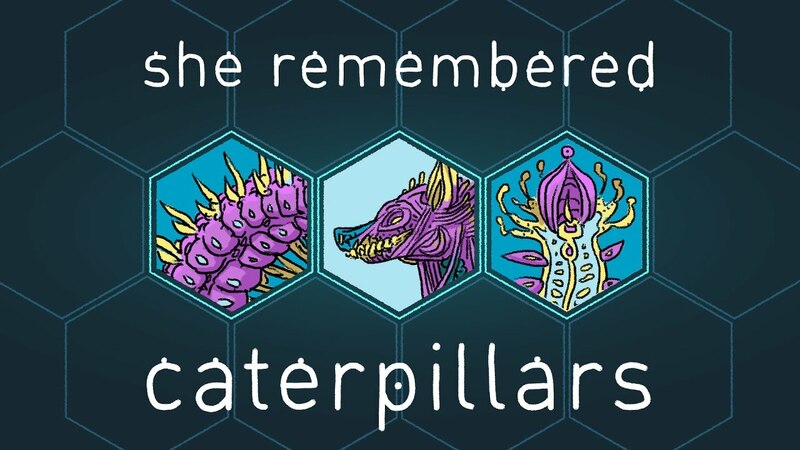 Released on Steam back in 2017, She Remembered Caterpillars is an easy to look at puzzle game that is driven by a hard hitting story. As a game that originally started out as a one man project, She Remembered Caterpillars has led an interesting development cycle as a team was formed and rewrites took place, and I can happily confirm the end result does justify the means. Still, I’m getting a little ahead of myself, so let’s reel it in and talk about the game. Described as being a fungipunk fantasy, She Remembered Caterpillars is a colour-based puzzle game all about “love, loss and holding on,” which players can expect to experience for themselves across the game’s 8 Acts. Just be sure to keep the tissues close to hand because this is one game that can make you go from mad to sad, within seconds. Where this particular lovely puzzle game comes into its own however, is the fact anyone capable of sight is able to play it. While gameplay is colour-based and consists of players having to get each caterpillar on a given level to the intended goals, even those who are colour-blind are able to play it also, since each coloured playable character (called Gammies,) also features a particular shape, so even if you can’t see colour, or just have a character, a blue or green deficiency, as long as can see make out each unique shape, you should have no issues playing through She Remembered Caterpillars. One thing it does mean however, is if you do suffer from some form of colour blindness, or full on colour blindness, you will not be able to view She Remembered Caterpillars’ “phantasgamorphic world” in all its splendour. One aspect where merging is useful, is when you have a blue character and a red character and both need to cross a purple coloured bridge in order to get to a level’s goalposts. Other times though, there can be a red bridge and you will need to merge just to get both Gammies across, before splitting them up and having the red caterpillar cross the red bridge on its own. When players do need to operate multiple Gammies however, while you can use ZL and ZR to cycle between them, when playing in handheld mode, you can simply select any character of your choice by touching them on the touch-screen. Also, once a character is selected, you can press on the screen where you want them to go. I found this aspect a bit cumbersome, but it’s nice to have the option. Also, while a red Gammie can cross a red bridge, they can not walk through a gate that is the same colour of them, so players will need to be aware of this fact, especially during the later levels when it can save you from unnecessary backtracking. The biggest issue that I had with She Remembers Caterpillars though, is the fact in its initial form, there was a game breaking bug in a later level (35 of 40,) which actually prevents players from beating the game, but the developers are aware of the issue and a patch has been implemented. As for a pro, I must admit I did find completing each level enjoyable, since the act of doing so, would reward me with another snippet of text that further conveys the touching story of a daughter’s pursuit to save her father. Plus the ambient soundtrack by Thomas Höhl (best known for Deponia 1-3 and being the composer for Galaxy On Fire,) really helps to hammer home just how mesmerising the dreamscapes present in She Remembered Caterpillars, really are. While She Remembered Caterpillars might not be the meatiest of puzzle games out there, it is a beautifully poignant one that is deserving of a place in your digital library of Switch games. It is a nifty little title that is ideal for those who wish to escape their everyday life for a couple of minutes here and thankfully the game-breaking bug that once existed, is no more.